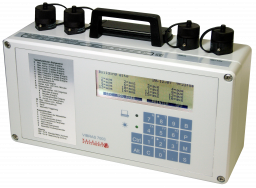 VIBRAS® are vibration measurement systems manufactured by WALESCH Electronic GmbH of Switzerland. These systems are built according to the standard DIN 45669, DIN4150-2. 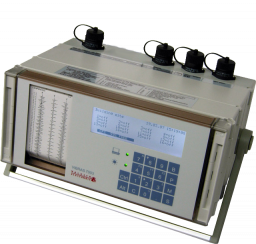 The system consists of the evaluation instrument and the sensors, which can be either analogue or digital. Up to 16 digital sensors may be connected to a single evaluation instrument. The system enables therefore simultaneous measurement of vibration at up to 16 independent locations, each in three orthogonal directions, i.e. 48 channels. 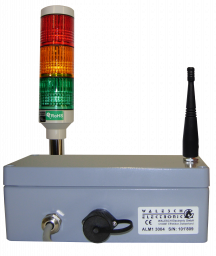 Due to the digital transmission of data it is possible to have the sensors located at considerable distances from the evaluation instrument, (e.g. a single digital sensor can be located at a distance of up to 1500 meters using a standard cable). 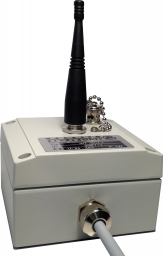 However, if the cables cannot be used, a wireless version of the system that works on the radio signal principle is also available. Measurement can then be taken at locations situated of up to approximately 1.2 km away from the evaluation instrument. Although the VIBRAS 7003 is virtually completely programmable parametrically, the operation remains extremely simple. For general applications the default parameters of the instrument may be used. Data Acquisition begins as soon as the required sensors are defined. Long strings of parameter entry are therefore unnecessary.